In politics, the adage goes, follow the money. And so, data abound for contributions from trial lawyers, insurance brokers, and even optometrists. But what about Islamists, those Muslims who seek to replace the Constitution with the Koran and apply Islamic law in its entirety and severity – who, in other words, seek not just to tweak the tax code but to change the nature of the United States? Until now, their campaign contributions have been unknown. A new initiative of the Middle East Forum's Islamist Watch provides a first look at the dimensions of this lobby, using a sortable database. The Islamist Money in Politics (IMIP) project (at www.islamist-watch.org/money-politics) finds that, over the past 15 years, prominent figures associated with six leading American Islamist organizations have donated almost $700,000 to federal U.S. candidates. Associates of CAIR lead the way in dollar terms, making over $430,000 in campaign contributions to candidates for federal office. That's a nice piece of change from a group named as an "unindicted co-conspirator" in America's largest terror-financing case, in which the federal judge found "ample evidence" of CAIR's links to Hamas. 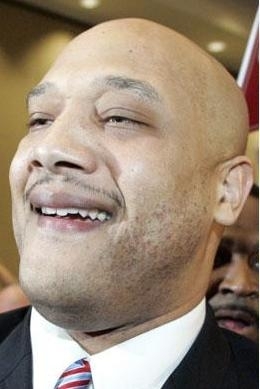 André Carson, Islamist favorite and congressman from Indiana. Overall, Islamist money is relatively minor in the forthcoming 2014 congressional elections, but IMIP information has several benefits. It holds politicians accountable for accepting funds from a soiled source. It signals the Islamist lobby's affections and intentions. And it tells voters who takes money from individuals linked to enemies of the United States and its allies. In Indiana, Democratic representative André Carson has received almost $34,000 from Islamist sources for his congressional runs since 2008. In contrast, his Republican opponent this November, newcomer Catherine Ping, has received not a dime from them. That's the same Carson who appeared at the 2012 annual ICNA-MAS convention, where he encouraged American schools to look "at the model we have in our madrassas ... where the foundation is the Qur'an." In Michigan's hotly contested race for an open U.S. Senate seat, Islamist donors this cycle have donated $2,576 to Republican Terri Lynn Land, and over three times as much to Democrat Gary Peters ($8,200). We now know who the Islamists like best in Michigan. This fits a larger pattern. In the 2013 and 2014 federal campaigns, Islamists gave Democrats $57,408 and only $3,326 to Republicans. That's a ratio of 17 to 1. Thanks to Islamist Money in Politics, the sun has begun to shine on this budding arena of Islamist influence. Future investigations will go beyond the six organizations and also look into state and local candidates, thereby exposing the ultimate in tainted political contributions.